For the serious Prop Collector! 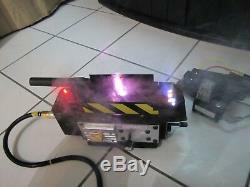 GH O STBUSTERS GHOST TRAP & Foot Pedal Prop Set with Lights and Wheels! 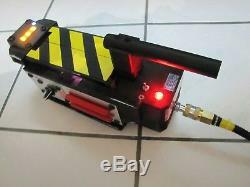 This is a Ghostbusters Ghost Trap & Pedal Prop Set (1:1 Full size scale) with great detail. Made with all new materials including Real Parts, wood, Mdf, metal, electronics and plastic. A rear Led power status light that flashes red. Yellow front forward indicator screen with Yellow Led lights. These lights also produce multiple flash patterns. Indicator status light that flashes up to 6 different c o l o r s! B right Ultra Violet (UV) constant Led lights for the interior of the trap. Do not stare directly at these lights for long periods of time. Counter sunk real metal wheels that allows trap to roll. Lower Metal Lower Slide through Belt holder for Trap transporting on your hip belt. Trap doors that open, hinged through the front Trap ears and rear supports just like the Movie. Doors are also air gun spray painted. Not hazard taped like some others Traps. Easy 2 screw removal of rear battery box cover to access batteries. (All brand new batteries included). Total of 6 control knobs that all turn with 2 front knobs and two side knobs that also extend - see pic 6. Real resistor, knobs, Wheel bearings, air connect fitting and all real heavy duty Black Oxide Allen head bolt screws. Trap is fully painted inside and out with a high quality oil-based semi-flat black paint. Comes with all Decals applied and Trap care/battery instructions. You can also use a Vaporizer into the Traps body light ports to create a cool smoke effect. (See pic 6 & 7). A lite weathered look has been added to parts of the trap to make it seem like it was slightly used in battle. GHOST TRAP FOOT PEDAL FEATURES. Real Allen head bolt Screws and Metal Hinge. Real red stripe ribbon cable with Zip ties. Real heavy duty cable wire used for the cord. Real brass quick connect/disconnect that connects perfectly to the Trap! Just push straight forward on the brass connect and it snaps on quickly with no pulling back on the plunger. Real plastic/rubber stomp hose that extends. Black Flex Wire Loom to protect power wire. Protective felts on the bottom of pedal to protect the pedal and floors from scratching. All our props are 100% hand built from scratch and painted Inside and out with a high quality oil based paint. This is NOT a Mattel or vintage Kenner toy, Not a 3D Printed prop or a feather weight plastic Spirit Halloween Trap like others offer. This is a heavy duty Ghost Trap PROP that feels and looks like it can really do the job it was intended to do. This is mainly an adult prop due to its weight, led light output among other things like slightly sharper edges on parts. Our props are 100% handmade and are presented in the photos above so the prop that you see in the photos is the prop that you will receive. Don't be fooled by others offering props that are needing to be made. This trap & pedal set are fully BUILT and READY TO ROLL OUT at this great price! Here's a small sample of our great feedback on our props. 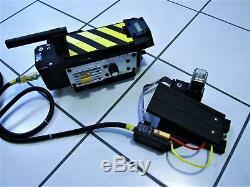 Ghostbusters Ghost Trap Movie Prop With Pedal & Lights (#160291097433). 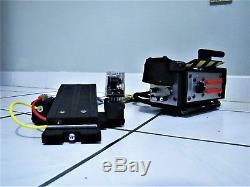 Ghostbusters Ghost Trap Movie Prop With Pedal & Lights (#160302359015). A very well made product. 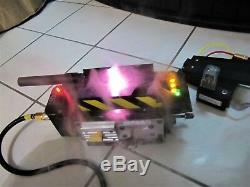 Ghostbusters Ghost Trap Movie Prop With Pedal & Lights (#160397706403). Great Communication and help when needed! 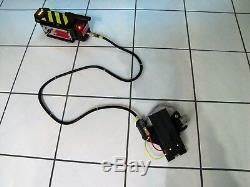 Ghostbusters Proton Pack Movie Prop With Lights & Vib (#160472654046). 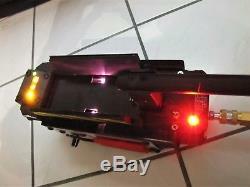 Ghostbusters Ghost RGB PKE Meter Movie Prop W/Lights (#160432699534). Looks great and works same! 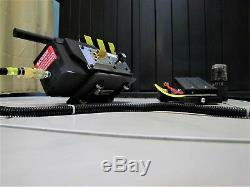 Ghostbusters Ghost Trap Movie Prop W/Pedal/Lights/Wheel (#160369639371). 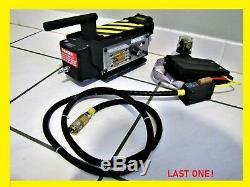 Ghostbusters Proton Pack Neutrona Wand Gun Movie Prop (#160553662279). This would make an excellent gift for any Ghostbusters fan, prop collector or use it on Halloween for an award winning addition to your costume. Thanks and have a great day! The item "Ghostbusters Ghost Trap & Pedal Movie Prop Set Halloween Costume Proton Pack Pke" is in sale since Saturday, January 19, 2019. This item is in the category "Entertainment Memorabilia\Movie Memorabilia\Props\Reproductions". The seller is "night_entertainment_productions" and is located in Palm Harbor, Florida. This item can be shipped worldwide.